Kevin Kajitani is passionate about improving the world through innovative business models. Together with his colleague, Akira Fukabori, Kevin has played a central role in the launch of multiple initiatives within ANA. 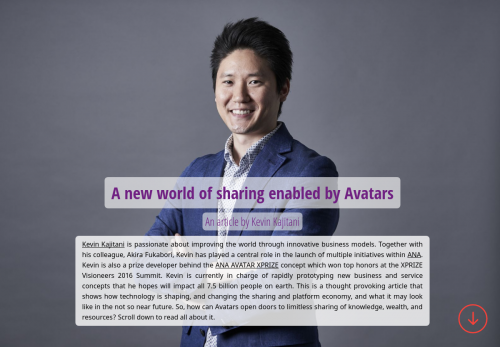 Kevin is also a prize developer behind the ANA AVATAR XPRIZE concept which won top honors at the XPRIZE Visioneers 2016 Summit. Kevin is currently in charge of rapidly prototyping new business and service concepts that he hopes will impact all 7.5 billion people on earth. This is a thought provoking article that shows how technology is shaping, and changing the sharing and platform economy, and what it may look like in the not so near future. So, how can Avatars open doors to limitless sharing of knowledge, wealth, and resources? Scroll down to read all about it. "Our ability to share our unique traits with the world is currently throttled by existing limitations of physical access. And the inability of simply getting the right people to the right place at the right time is arguably the single largest factor preventing us from limitlessly sharing our knowledge, wealth, and resources democratically with one another." Each and every one of us possesses a unique quality that we can share with the world, whether it be a skill or craft, a passion or perspective, a natural ability or acquired strength. I believe it is this diversity that fuels advancement in our world. Our individual contributions to society lead to chain reactions in the larger ecosystem we inhabit, with collisions of our intellect sparking innovative collaborations, curiosity, technology, discovery and the collective evolution of our species. Yet, our ability to share our unique traits with the world is currently throttled by existing limitations of physical access. And the inability of simply getting the right people to the right place at the right time is arguably the single largest factor preventing us from limitlessly sharing our knowledge, wealth, and resources democratically with one another. As an airline, ANA’s contribution to society throughout our history has been providing a means of physical access by transporting passengers around the world. For over 100 years, the core infrastructure of the airline industry has served as the catalyst for globalization by facilitating shared experiences, global relationships, international business, diplomacy, and mutual understanding. As such, the topic of connecting people across long distances and facilitating knowledge sharing, collaboration, and serendipitous encounters is one that is close to our hearts. But the reality is that although airlines are the sole providers of long distance physical access, we are still unable to democratically provide this service to the world. Today, our industry transports less than 10% of the world population each year. This realization led me and a colleague at ANA, Akira Fukabori, to question our true mission as a company, to reimagine what is possible, and to pioneer the world’s newest form of physical transportation—avatars. What we define to be an avatar is a remotely operated system (like a robot) that allows its operator to see, hear, feel, and interact with a remote environment as if the operator were physically there. It is essentially the teleportation of consciousness. What is important to note is that this is not a technology that simply represents you in a virtual world but is a physical extension of yourself in the real-world. Imagine what will be possible with this new capability to teleport yourself to anywhere in the world effortlessly. This is the future that avatars will enable. And as far-fetched as it may sound, this future is approaching quickly. The technologies needed to create real-world avatars are available today and what will propel this innovation forward is the massive, positive impact it will have on the world. "This will enable doctors to login to perform remote diagnosis and treatment, teachers to share their knowledge with those who want to learn, and for children to explore new parts of the world-all with a single avatar unit. " In the near future, general purpose avatars will be available to the world. This will enable doctors to login to perform remote diagnosis and treatment, teachers to share their knowledge with those who want to learn, and for children to explore new parts of the world—all with a single avatar unit. One general purpose avatar placed in a remote area of the world will instantaneously provide that region with access to all of humanity’s resources—every doctor, teacher, artist, engineer, and scholar in the world. This is a quantum leap from video conferencing as this technology will allow us to impact, manipulate, explore, and interact with remote environments. And as avatars become a common infrastructure in every community, it will empower individuals to share their tangible knowledge, skills, and resources with the rest of the global community, one hour at a time. Avatars will play a key role in reducing socio-economic gaps that exist in our world and help to unleash humanity’s full potential for the very first time. As such, I believe avatars will become the world’s ultimate sharing economy platform. What is more thought provoking is that development of avatar technology is already underway. The proof of concept for avatars already exist in many forms and multiple simple telepresence robots are available for purchase today, allowing people to communicate and explore environments from hundreds of miles away. And when you stop to consider the components that are necessary to advance this technology, you realize that all of the core parts—from the robotic and sensing components to the haptic feedback systems—are advancing exponentially. After recognizing the need for avatars and confirming that the technological landscape is ready to create such systems, it was a natural progression for us to commit to pioneering this new capability. Recently, we launched our $10 million ANA AVATAR XPRIZE to incentivize teams from around the world to integrate exponential component technologies to accelerate the development of the world’s first general purpose avatar. We are also developing the world’s first avatar platform application—like the uber or airbnb of avatars—and aim to release basic avatar services to the world within the next 12 months. "What is more thought provoking is that development of avatar technology is already underway. The proof of concept for avatars already exist in many forms and multiple simple telepresence robots are available for purchase today, allowing people to communicate and explore environments from hundreds of miles away. " After many months of researching, testing, and developing avatars, I am convinced that even the simplest avatar services will have large, lasting impacts on our global economy, society, and lifestyles. It will open up brand new markets for tourism, education, healthcare, consumer consumption, agriculture, space exploration, re-mobility, skill sharing, and more. And because this emerging avatar industry will be built upon the sharing economy model out-of-the-box, its ability to scale and impact the world will be immeasurable. In a nutshell, avatars will allow cities and towns in every part of the world to share their resources—whether it be skilled labor, a medical professional, a rare art collection, or a vacant office—effortlessly with one another. In nearly all cases, new technology tends to bring us further away from one another—replacing human interactions with virtual experiences and human effort with autonomous systems and artificial intelligence. But avatars will be different. They will be an extension of humanity that will bring us closer and compel us to meet one another in the flesh.